The image at right is an arrangement of visual components drawn from the tradition of the Yi Ching. In that tradition all of existence can be represented by two lines. One line is solid and represents half of all that is, including masculine qualities. The other line is segmented and represents everything else, including feminine qualities. Together, they might be thought of as depicting a state of balance, about which the Yi Ching has much to say. But the Yi Ching also comments upon 64 states of imbalance, each of which is represented by a hexagram composed of six lines. 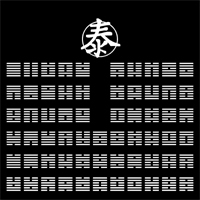 The image in the upper right above presents 63 hexagrams from the Yi Ching arranged in such a way that when viewed together they imply the otherwise omitted hexagram, which is called T’ai ( ). The hexagram T’ai depicts masculine aspects grounded by feminine aspects. Earth above heaven. One interpretation of that configuration is that even though deep chaos abides, by carefully responding to the rhythms and cycles of the world, peace can be found.